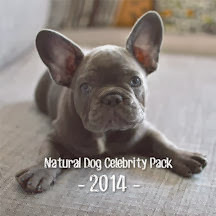 $2500 to the French Bulldog Rescue Network. 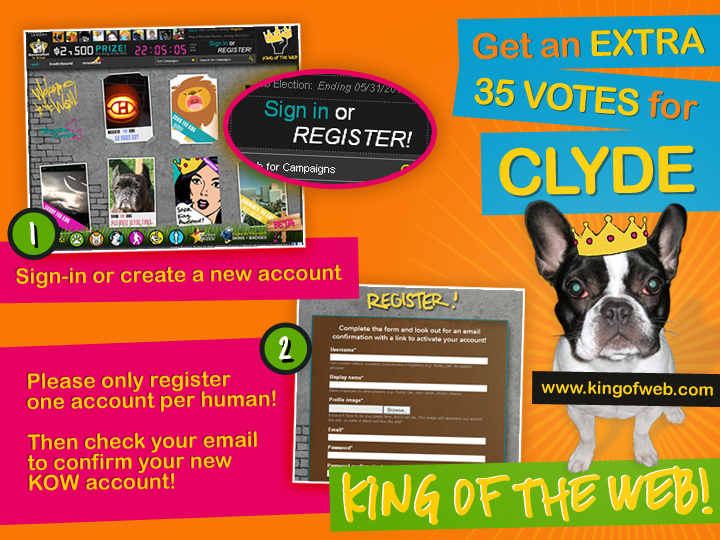 Here are instructions for setting up an account for voting for Clyde. Please only set up one account. 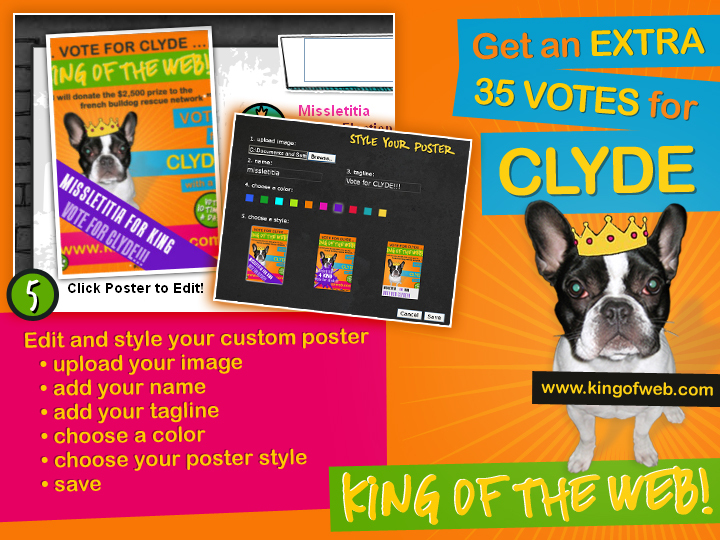 Please vote every day through the end of the contest. It's a little time-consuming, but hey! $2,500! There you go! And you can get another 10 votes just for leaving an encouraging word on Clyde's page under "Say Something." 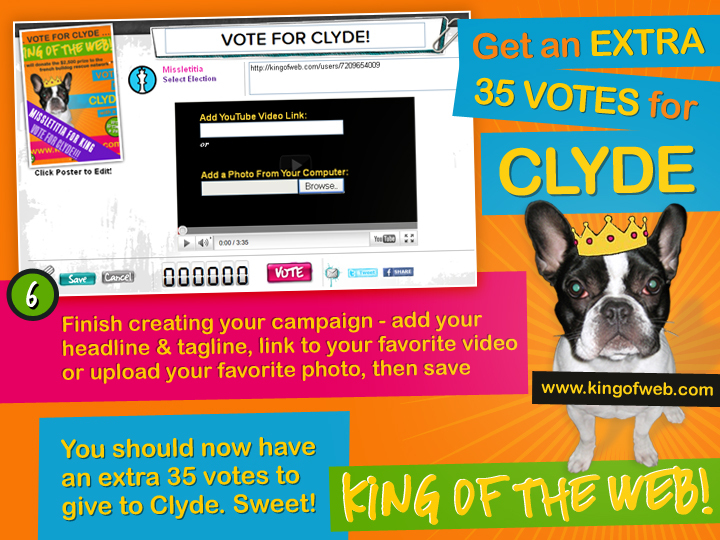 You don't have to do another thing with your "campaign," but you get a fresh new 10 votes every day for Clyde with a Y. 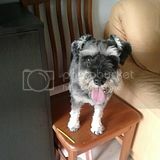 He's a former foster, living with gusto in the free world. Awesome! I'll go right over! That's awesome. Loves those adopted babies! You are good friends to Clyde. He's a lucky boy as well as handsome. Hope he wins. 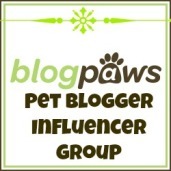 wow all yous gots to do is point us in the right direction and we are OFF! I am on the way to vote for Clyde! Thank you Benny and Lily for getting the word out about Clyde with a Y! 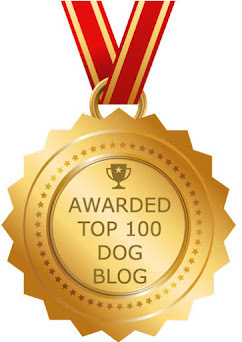 He has a real chance of winning which means $$$ for spays, neuters, heartworm treatment, and palate trims for FBRN fosters--oh yeah but not just vet visits; I bet some treats and stuffies are in store for them too as they await their forever homes! We heart Benny and Lily! 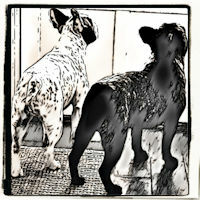 Sir Humphries and Bella Bean, your fans from Harlem, NYC! Don't worry her is not givin' up! We like names that have Y's in them! We are off to see what we can do for Clyde. I am going to do it now! What a great fur-iend you are!! Very cool! We'll check it out. 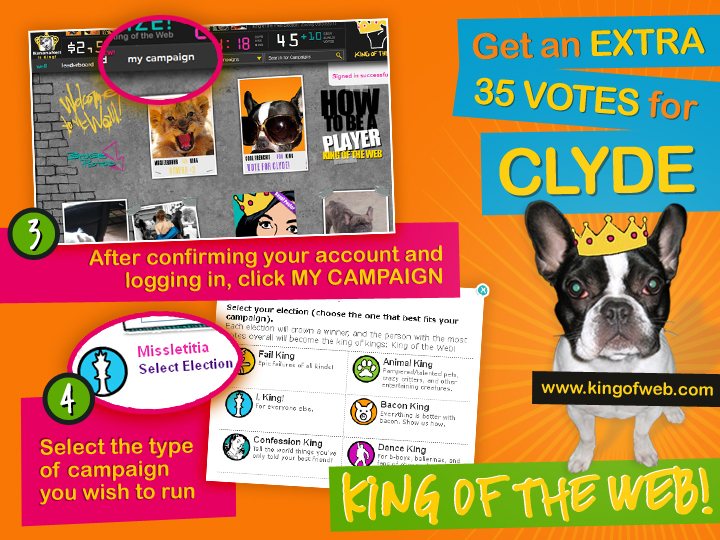 I've been votin' for Clyde too! He's doing good things for the little frenchies. I can't imagine being a foster without a family of my own.